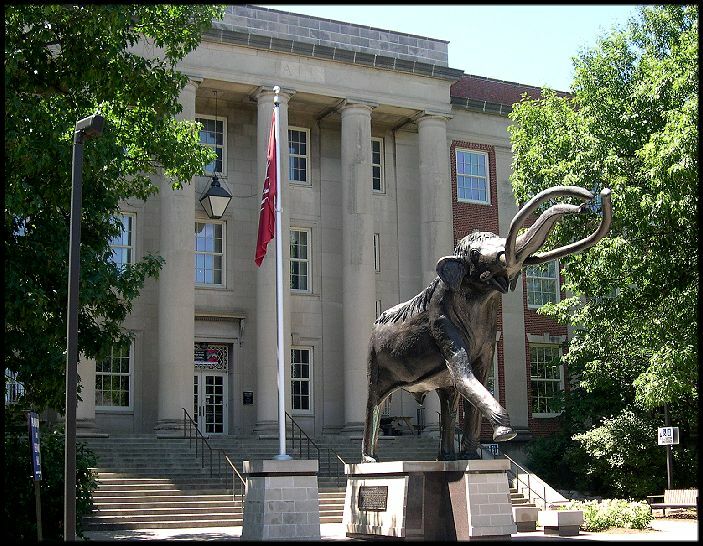 The University of Nebraska State Museum has a spectacular collection of Tertiary fossils, including what is probably the most extensive exhibit of mammoths and mastodons in the world. My interests, however, remain in the area of marine reptiles and life in the Western Interior Seaway during late Cretaceous time. Here are a few examples of exhibits in this museum. LEFT: First, the museum has a wonderful, large scale map of North America during the late Cretaceous. 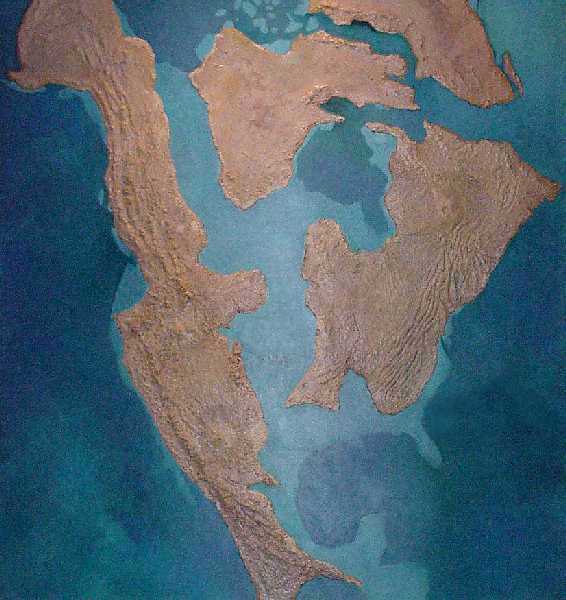 Note that the shorelines of the Western Interior Seaway changed almost continuously as sea levels went up and down, and the western half of North America was pushed upward by the collision of continental plates. LEFT: In 1970, Sam Welles published a brief note entitled "The Longest Neck in the Ocean" about the discovery of a very large elasmosaur (UNSM 50132) collected from the Graneros Shale of eastern Nebraska in 1964. The specimen was found essentially complete although some caudal vertebrae had eroded out and been lost prior to its discovery. 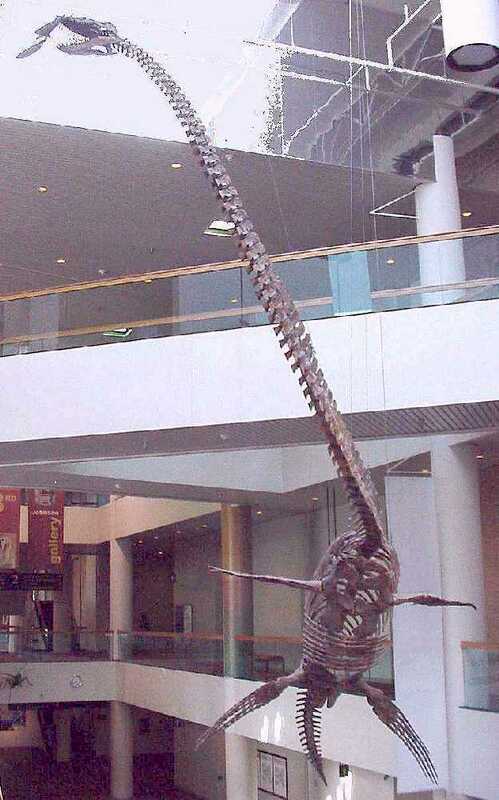 The elasmosaur (Thalassomedon haningtoni; UNSM 50132) was reported to be about 41 feet long. 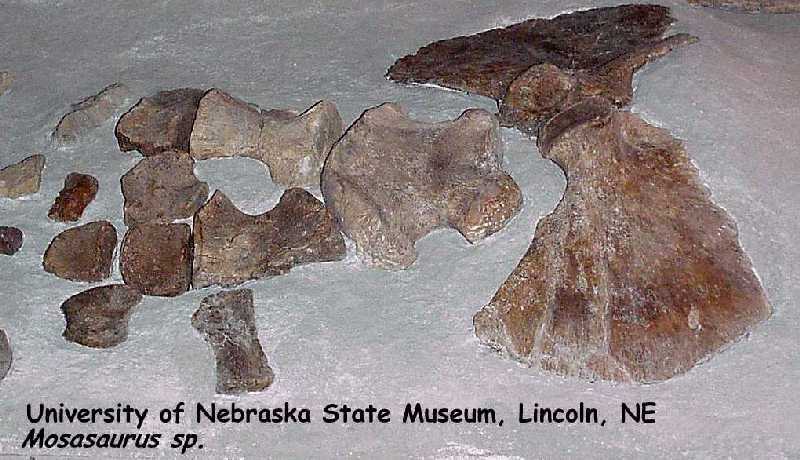 LEFT: UNSM 1195: The museum has another partial plesiosaur specimen, collected from the Lincoln Member of the Greenhorn Formation, near Holyrood in Ellsworth County, Kansas by George F. Sternberg and M. V. Walker in 1931, and sold to the University of Nebraska in 1935. The specimen consisted of the pectoral girdle, limb elements (all four paddles), 45 vertebrae including most of the caudal series, two teeth and numerous gastroliths. Although the skull was missing, Sternberg did locate two teeth. Sternberg also noted the presence of numerous shark teeth in association with the remains. 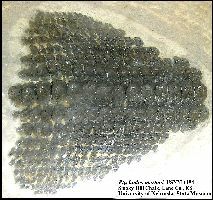 This photograph (circa 1931) was taken before the specimen was sent from Kansas to Nebraska and shows the gastroliths lying alongside the same paddle as above. According the the documentation that went with the specimen, the remains were fairly complete, lacking most of the cervical vertebrae and the skull. The specimen was found by Joe Purzer, a petroleum geologist from Bartlesville, OK. ---- See Everhart, M. J. 2007. Use of archival photographs to rediscover the locality of the Holyrood elasmosaur (Ellsworth County, Kansas). Kansas Academy of Science, Transactions 110(1/2): 135-143. This is a recent (2005) picture of the more than 240 gastroliths (stomach stones) found associated with the above plesiosaur remains by George Sternberg. 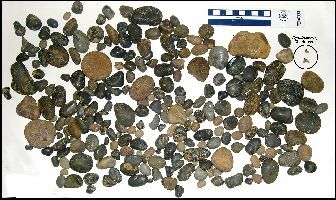 The largest stone measured 79 x 57 x 28 mm and the total weight of the gastroliths was 2.2 kg. At least two Squalicorax teeth were curated with the specimen and are included with the gastroliths (In circle). A view of a front limb of a Mosasaurus sp. 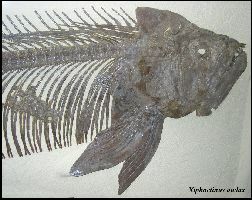 specimen from the Pierre Shale. LEFT: The lower jaw and skull of a large Tylosaurus proriger (UNSM 1204) shown from below. The specimen was discovered and collected by George Sternberg in 1925 from the Smoky Hill Chalk of Logan County, KS. The preservation of this specimen is rather odd and the specimen is mounted high enough on the wall that the top of the skull is not visible. 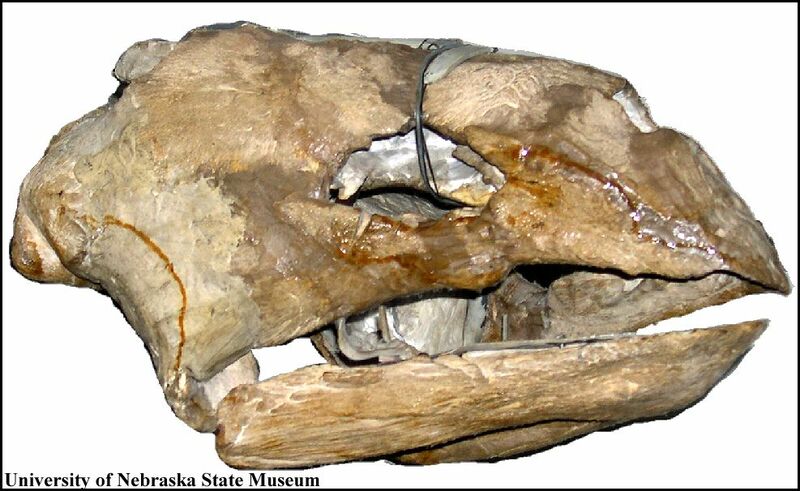 The length of the skull is 49 inches, similar in size to VP-3 at the Sternberg and FFHM 1997-10 at the Fick Fossil and History Museum. 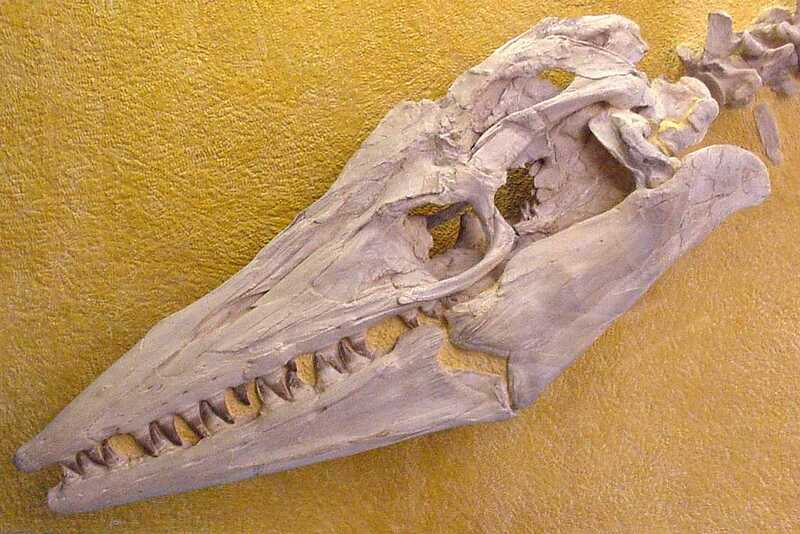 LEFT: Although identified by George F. Sternberg as Tylosaurus proriger, this large specimen in the UNSM is actually T. nepaeolicus, based on the location of the parietal foramen. Sternberg described the specimen: "The top of the skull with nearly every element in place except the parietals and the squamosals which are present but somewhat out of place at the back. The upper teeth were damaged beyond repair and the lower jaws crushed too badly to be saved, so this specimen has been prepared to show the top view only. The length of the skull is 36 inches." LEFT: The exhibit specimen of Protostega gigas overhead in the UNSM. This specimen was collected by George F. Sternberg and has been partially restored. Sternberg's description of the specimen: "Skull and lower jaw were nearly complete. Six nearly complete ribs, the longest one is 25 inches. A large share of the right hyoplastron and part of the left. A large share of the left hypoplastron and very little of the right. It is not possible to make measurements as the sections are not together. 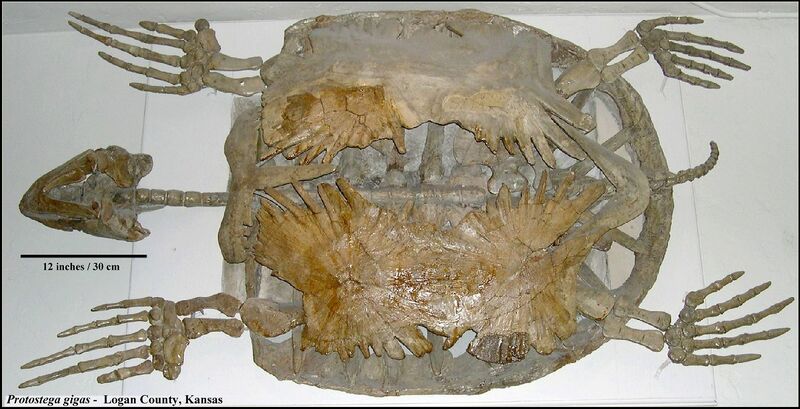 There are several marginal plates, 6 or more caudal vertebrae, 2 neural plates. What I take to be the right front limb with part of the carpals and a number of finger bones. Procoracoid-scapula greatest length 15 inches. Coracoid is 18 inches. Ulna 7 1/2 inches. One pubis is present and one femur. ... the skull is especially fine." LEFT: The nearly complete specimen of a Nyctosaurus gracilis from the Smoky Hill Chalk of western Kansas on exhibit in the University of Nebraska State Museum, Lincoln Nebraska. Collected near Elkader, Kansas and prepared by Greg Brown (Brown, 1978, 1986), this specimen is significant because it shows that Nyctosaurus had three wing phalanges, not four as shown by Williston (above). The wingspread on this specimen would have been about 2.4 m (8 ft). 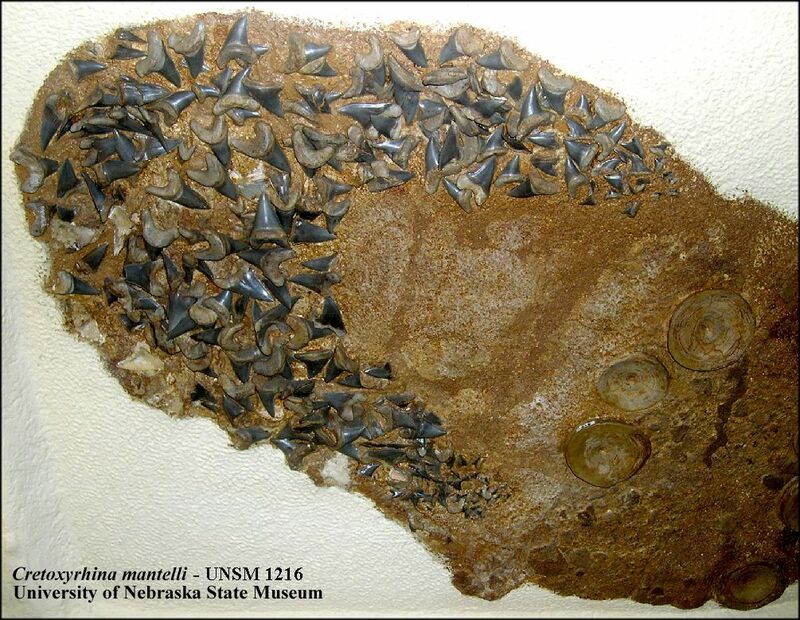 LEFT: A 3.5 m Xiphactinus (UNSM 1495) with stomach contents (a partially digested Gillicus) at the University of Nebraska State Museum. 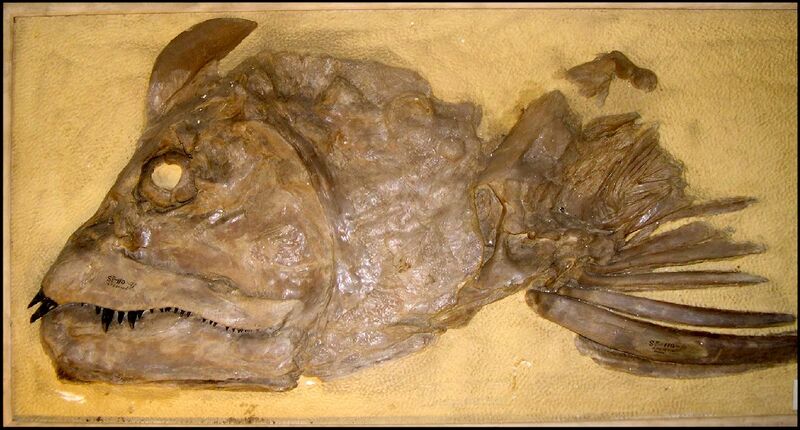 The specimen was collected and prepared by G.F. Sternberg in 1946, and was on exhibit in the museum at Fort Hays State University until it was replaced by the famous "Fish-within-a-fish" specimen about 1952. 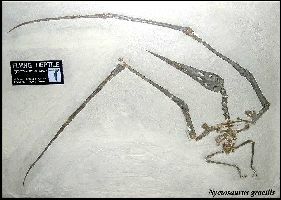 One of the original pictures of this specimen while it was still in Kansas is HERE. 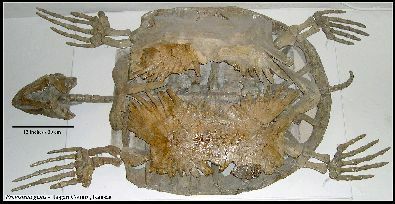 RIGHT: The skull and left pectoral fin of another Xiphactinus audax collected by G.F. Sternberg and acquired by the UNSM about 1935. 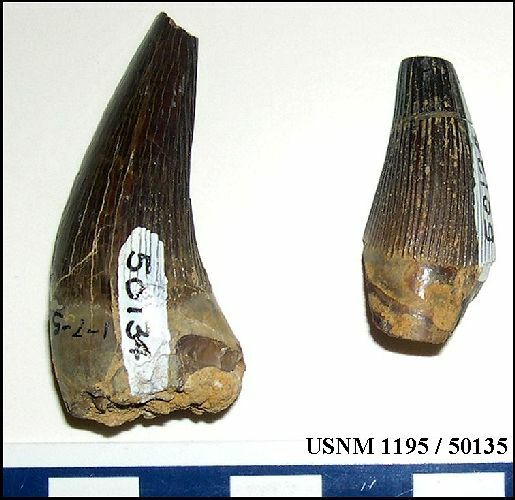 LEFT: UNSM 1216: The well-preserved remains of a large Cretaceous shark (Cretoxyrhina mantelli), showing the teeth, the outline of the head and a few vertebrae (Sternberg's Sp. 103-39). "Shark-tooth-slab, Isurus mantelli?---Horizon: Niobrara Cretaceous chalk. Locality: About 10 miles north of Ellis, Kansas Collector: George B. Pearce. Description: An incomplete skull with nearly three hundred teeth lying in a horse shoe bend, dropped in all directions. 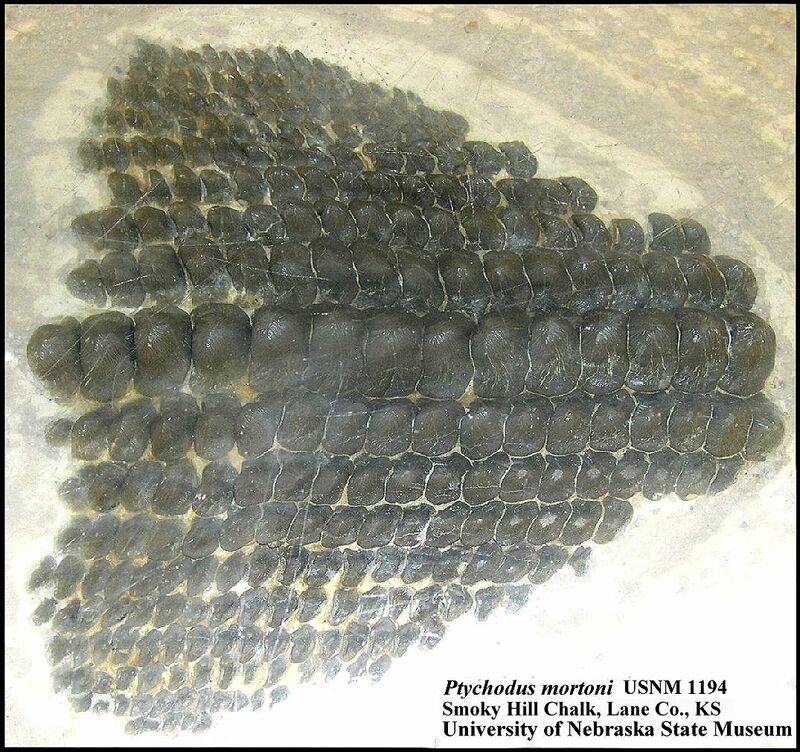 There are 8 vertebrae shown lying flat, the largest 3 1/2 inches across. The cartilage at the back hasn't been dug into and shows through badly checked. Forward it has been chipped away to expose the teeth. Depth of the teeth arrangement is 21 inches, the width 19 inches. The largest teeth in front are 2 1/8 inches long over all, very straight and massive with roots. The extreme back ones on either side have small points or barbs on either side. A few teeth have been placed in position by the preparator but most of them are just as they were when found. The outer edge of the cartilage has been shaped more or less to conform with the tooth arrangement. The plaster slab is 36 inches by 29 inches over all without a frame. The teeth are extremely fine. This is a very attractive specimen, very rare with teeth together. The blue-gray oak frame gives the specimen a very nice appearance." "263 teeth mostly in their original positions found with the roots so they can easily be placed in a plaster slab, turned over and cleaned up. The teeth around the edge would have to be properly placed. 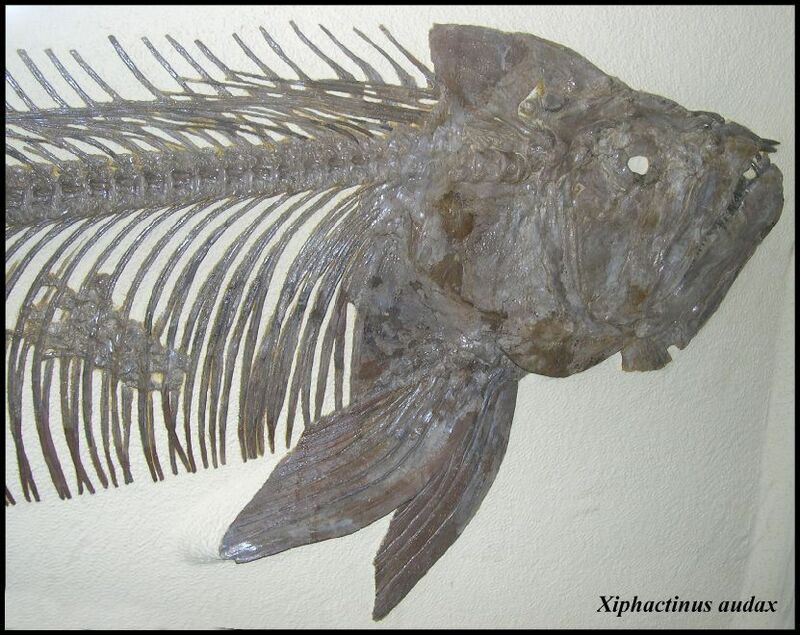 Looks like Ptychodus mortoni Williston."